THE COBRA ELIMINATOR REDIFINES THE WORD ‘FAST’. FEATURING THE SLEEK LOOK AND FEEL OF AN OLYMPIC STYLE K1 AND THE DURABILITY PROVIDED BY POLYETHYLENE CONSTRUCTION. It is designed for racing and for the use and abuse that is part of competition training, high performance exercise and youth racing programs. A foot-operated rudder provides for easy, controlled turning and an adjustable footrest and moulded seat provide an ergonomic fit. The deck shape enhances correct paddling technique by allowing the entry blade hand to come close to the deck at the beginning of the stroke. The Eliminator is available with adjustable seats, adjustable foot pedals and the Cobra rudder system. 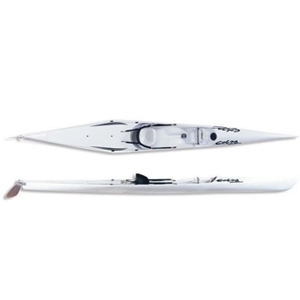 Extremely stable for low weight and smaller paddlers, the Cobra Eliminator is the choice for teaching your competition paddlers across the globe. Complete with: Handles, Drain Plugs, Adjustable Seat and Rudder System.